FGBC Moderator Bob Fetterhoff (center, yellow shirt) is meeting today with the board of the Brethren Missionary Herald Company to discuss communication issues relating to the future of the FGBC. 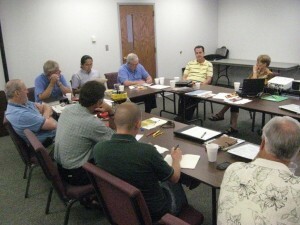 Pastor Bob Fetterhoff (top center of photo, yellow shirt) is spending some time today with the board of the Brethren Missionary Herald Company discussing ways in which BMH can assist the Fellowship of Grace Brethren Churches with its mission to connect and inform churches and Grace Brethren people about each other’s ministries. Fetterhoff is the current moderator of the FGBC and is hosting the annual conference of churches at his Wooster, Ohio, church this week. Discussion today centered around storytelling efforts to inspire and motivate effective communication. Also joining the conversation was Keith Minier, pastor of the Grace Brethren congregation in Pickerington, Ohio, who gave perspective reflecting his young, fast-growing congregation’s issues and needs.